In 1885, the German psychologist Hermann Ebbinghaus discovered you don’t just forget facts randomly, but at a predictable rate. Ebbinghaus recorded his findings in his book Memory: A Contribution to Experimental Psychology. Because this theory is so powerful, it allows you to learn more, by studying less. Ebbinghaus called his most important discovery the forgetting curve. It shows that you forget things exponentially. This means that if you review an item in the moment you are about to forget it, you will remember it a little longer. Initially repetitions may need to be made within days, but later they can be made after years (the intervals grow exponentially). With BetterMemo, we have made spaced repetition learning easy enough for anyone to use. You don't need a Ph.D. to take advantage of this learning method. In fact, BetterMemo is as easy to use as your email client. Just enter your notes and it will remind you to review them in the right moment. The curve starts at the top left. This is the time when we enter the note in BetterMemo and know it 100%. As time passes, we gradually forget the note and after a day, we remember it only at 50%. So we do a review of the note and our knowledge goes back up to 100%. After a week we retain around 60% of the information, but this time the forgetting rate is lower - we remember it better and longer. 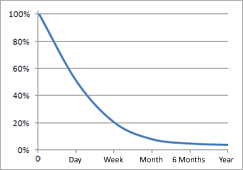 With each review, the forgetting curve is flatter, until the moment, when it gets practically straight. In this moment we know the note well enough, as it is permanently burned in our mind.